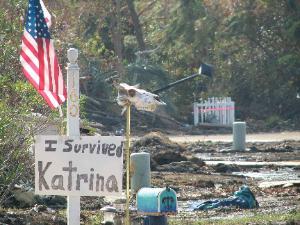 Katrina disaster, I have been frustrated and surprised. would quickly follow. Then the phone rang. Cross public affairs efforts. My heart soared. Cross public affairs handbook tucked under my arm. no rules, only uncharted territory that everyone is still trying to discern. those who were stranded never waned. general Katrina relief. I was right, and I was wrong. guys?â€� they would ask. I could only tell them we were on the way. the hands of those who were lost among their own. anywhere to turn for help. teams move on to other stories. meet each other as they are to be a part of the Red Cross. and has kept in contact with him since. Red Cross since 1991 and has helped out with more than 38 disasters. Gulf Coast, and she ran the public affairs desk alone for five days. accentâ€� and offer a joke or two about being from Los Angeles. they were desperate to share. medication that I have seen pass through various shelters. But the frustration persists, and the calls for help do not end.